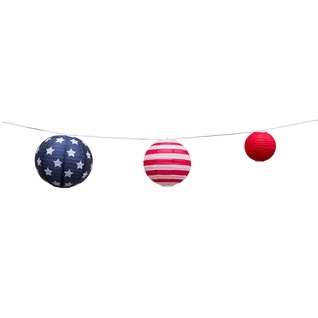 8/12/14 Inch 4th of July Red, White and Blue Round Paper Lanterns, Even Ribbing, Hanging Decoration Set (3-PACK) on Sale Now from PaperLanternStore! Be proud and show off your colors with our Patriotic 4th of July Independence Day Stars and Stripes Paper Lantern String Light Party Decoration COMBO 3-PACK! 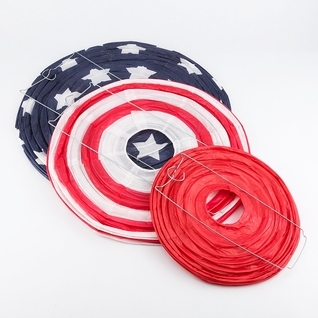 This kit includes 3x assorted 4th of July-themed Paper Lanterns designed to emulate our America's beautiful flag! Great for backyard BBQs and patio settings, these lanterns have a wire expander for easy hanging from String Lights , wire or around the house.